Note: This article was originally published in the November 2008 issue of the Denver publication Community News. Here's the basic difference between an herb and a spice. The leaf of a plant used in cooking is an herb, whereas any other part of the plant (often dried) is a spice. Spices can be buds, bark, roots, berries, aromatic seeds, and even the stigma of a flower, as in the case of saffron. The record of the use of herbs and spices goes back thousands of years. The traditional Indian system of medicine known as Ayurveda evolved more than 5000 years ago in the Himalayas. Emphasizing diet, it focuses on the prevention of disease. In Ayurveda, basil is used to protect the heart, cinnamon is used to stimulate circulation, and ginger is the "universal medicine." The ancient Sumerians recognized the health benefits of thyme as early as 5000 B.C., and the Mesopotamians cultivated garlic as early as 3000 B.C. The ancient Egyptians fed their slaves radishes, onions, and garlic to keep them healthy. In ancient Greece and Rome, mint was used to aid digestion and rosemary was used to improve the memory. Rosemary is still burned today in the homes of Greek students who are preparing for exams! Nowadays, scientists are researching the effects of herbs and spices as they affect cardiovascular health, metabolism, aging, cancer, mental health, and cognition. There is growing recognition that herbs and spices can do far more than simply make food taste better or provide extra nutrition. Some like it hot - with good reason: Cayenne pepper, Tabasco sauce, ginger, and even cinnamon can increase metabolism and the body's fat-burning ability. Mustard also has fat-burning properties, and can relieve respiratory complaints. Ginger can also relieve motion sickness and nausea. Be careful with it, though, as it can hinder blood clotting. If you're going to have surgery or if you take blood thinners or aspirin, you might want to avoid ginger. Good, and good for your heart: The consumption of garlic and garlic oil has been linked with the reduction of total cholesterol, LDL cholesterol (the "bad" kind), and triglycerides. Rosemary can help prevent damage to blood vessels that raises heart attack risk. Battling cancer: As a breast cancer survivor, I am always interested in anything that research says can help protect against cancer of any sort. One lengthy and scholarly article I read (it had more than 100 scientific articles listed as references) named basil, lemon grass, mint, nutmeg, parsley, rosemary, spearmint, and turmeric as having shown anti-cancer effects in animal studies. Turmeric, a main ingredient in curry, seems to be especially good at helping to prevent cancers of the colon, skin, liver, and prostate. Certain components of rosemary may inhibit breast cancer. Plants and mental health: There is a long history of using plants to influence psychological states.Various herbs have long been used to reduce anxiety and promote relaxation. Even Peter Rabbit's mother knew about the relaxing properties of chamomile, and passion flower is recommended as a sedative by the German Commission E, a government-supported committee that evaluates herbal preparations from medicinal plants. Valerian also has sedative properties. I frequently use chamomile tea or valerian capsules if I have trouble sleeping. Both are available in health food stores. If your goal is to perk up your brain and/or improve your memory rather than to relax, try ginkgo biloba or ginseng, both used in traditional Chinese medicine. Sage is also potentially helpful to the memory, and there is some evidence that garlic can slow brain aging through its antioxidation properties. However, no study that I read suggests any more than a slight boost to cognition from any one food. Most people find that reliable old caffeine, as found in coffee, tea, colas, and chocolate, gives them as much of a mental boost as they need. Just be careful with those popular "energy drinks," as they can contain excessive and even dangerous amounts of caffeine and other stimulants. 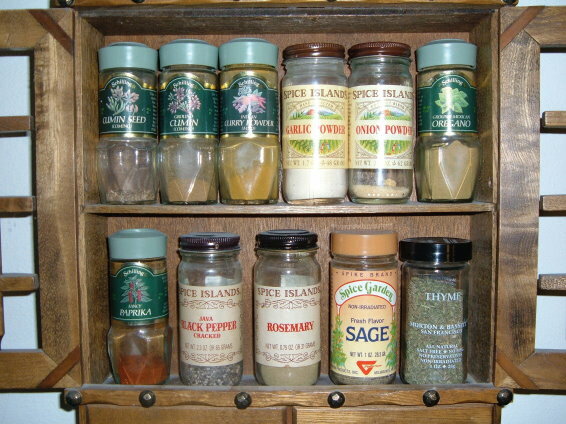 Herbs, spices, and Type 2 diabetes: I found many references to herbs and spices that can help manage diabetes. Italian herbalists use bilberry, cinnamon, dandelion, garlic, ginseng, and prickly pear cactus for glucose control. Ginseng can help some people lose weight, too. Osteoarthritis: Ginger has been shown to have a mild to moderate effect in reducing knee pain. In spite of its hot, spicy taste, ginger appears to inhibit the inflammation process. It's common for older people to have some loss of the senses of smell and taste, especially if they take several medications. By increasing their intake of herbs and spices, seniors can increase their enjoyment of food without increasing their salt intake. Basil, oregano, and thyme are not only delicious, but also provide valuable antioxidants. So, dear readers, enjoy all those wonderful herbs and spices, knowing that they are both good and good for you!